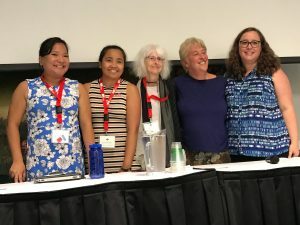 Margaret Allen shares her reflections from the August 2018 International Federation for Research in Women’s History conference held in Vancouver, Canada. Vancouver, British Columbia, Canada. Unceded territories of the Squamish, Tsleil-Waututh, and Musqueam Nations. Photograph by Matthew Field, 2008. Image via Wikimedia Commons. 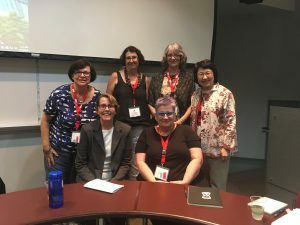 Many members of the Australian Women’s History Network recently wended their way to Vancouver, Canada for the 2018 International Federation for Research in Women’s History (IFRWH) conference, ‘Transnationalisms, Transgressions, Translations.’ This year, the conference took place on August 9 to 12 at the Harbour Centre, Simon Fraser University. Originally, the conference was to be held at the University of California Santa Barbara campus of Professor Eileen Boris, the current president of the IFRWH. But after the 2016 presidential election in the United States, when it became apparent that a US venue would be hostile for many foreign and gender diverse delegates, the IFRWH executive decided to move it to Canada. Subsequent events have demonstrated just how wise this decision proved to be. Thus the conference fostered a friendly atmosphere and welcomed delegates from a wide variety of countries, including sizable numbers from both Australia and Japan. Indigenous Feminism, 2018: panel chair Jennifer Spear, with Sarah Nickel, Maylei Blackwell, and Lynette Russell. Image via IFRWH. Lynette Russell (Monash University) then explored the relationships between ‘Australian Indigenous Cultures and Feminism,’ while Maylei Blackwell (UCLA) reviewed the ‘Scales of Justice: Indigenous Women’s Organising in Mexico and Beyond,’ examining the development of and the links between local, regional national and continental levels of organisation. There were so many great panels and papers this year – and too many clashed with others that I had to miss. Some that particularly captured my imagination were by Ashwini Tambe (University of Maryland), who explored intergovernmental debates about setting common standards for the age of consent in both the League of Nations in 1920 and the United Nations during the 1950s. Tambe demonstrated the pervasiveness of racial ideas within these debates, examining how certain exemptions were made for tropical countries on the grounds of ‘early sexual maturity’ due to alleged climactic effects. In the ‘Translating Agency’ panel, Laura Rademaker (ANU) recast the old story of Dormitory Girls on the Tiwi Islands in northern Australia from one privileging white authority to one which made the Tiwi people central in their own histories. Arunima Datta (National University of Singapore) gave a fascinating presentation entitled ‘Indian Travelling Ayahs and the Ayah’s Home in Britain’. These Ayahs accompanied British families with children on voyages to and from India. Hereafter, the Ayah’s Home in London took in those women who were left with no money and no home following a sea voyage. Its mission was to brown women suffering from the cruelty of their British colonial employers. Michiko Takeuchi’s (CSU Long Beach) careful exploration of transnational networks between American and Japanese women, chiefly in the Young Women’s Christian Association (YWCA) in the inter-war period, demonstrated how this collaboration enabled the post-war labour regulation benefitting Japanese women workers. A variety of women travellers danced before us. In assessing the life of Mary Pos, travel journalist and world networker, as a transnational figure, Babs Boter (Free University, Amsterdam) suggested a check list for such an assessment, including border crossings, her correspondents, languages spoken, her loyalties and self-identification and selection of topics and portrayals. Less illustrious travellers were discussed by Frances Steel (University of Wollongong), specifically the waitresses who worked on Matson Line ships across the South Pacific from the 1950s. As Barbara Brookes (University of Otago) revealed, Anna Longshore Potts, a graduate of the Philadelphia Women’s Medical College, was an enterprising lecturer, business woman and health missionary in the 1880s. Potts crafted an international career across the United States, New Zealand, Australia, Ireland and Britain. And finally, Rumi Kasutake (Konan University) argued that an early-twentieth-century Hawaiian businesswoman, Alice Noda, transgressed culture and gender norms to develop a hybrid identity. I thought of the feminist concept of ‘world-travelling’ when I heard Fang He’s (UC Santa Barbara) presentation, ‘Searching for Cinderella.’ Fang considered how Americans denigrated Chinese foot-binding during the early twentieth century. At the same time as describing the practice as backward, Americans were beginning to make a fetish of the tiny foot through competitions such as for the Chicago Cinderella and the rage for stiletto heels. As other presentations attested, Australian women have often been on the move. Benjamin Auberer (University of Heidelberg) discussed the work of Australian shorthand typists, a group often ignored by historians. Speaking about ‘A Good Example of the Roving and Versatile Type of Australian,’ he examined the travels and networks of shorthand typists at the League of Nations. Auberer emphasised the value of the address book as an historical source to flesh out the careers of these mobile women. Persia Campbell, the ‘consumer-Minded Economist’ of the early twentieth century, was highly influential in the United States and at the United Nations. But as Anne Rees (La Trobe University) noted, Campbell has been overlooked in a top-down history of international governance. Sophie Loy-Wilson (University of Sydney) focussed on Eleanor Hinder, who spent years working to improve women workers’ conditions in mid-century Shanghai. Her welfare career, which began at Farmers department store in Sydney, spanned the YWCA, the League of Nations, the International Labour Organisation and the United Nations. Migrants and Movements, 2018: Ethel Tungohan, Hessed Torres, IRFWH president Eileen Boris, Annelise Orleck, and Emma Amador. Image via IFRWH. Studies of feminist activism came to the fore in Judy Tzu-Chun Wu’s (UC Irvine) recuperation of Patsy Takemoto Mink. The first Japanese-American woman lawyer in Hawaii and the first woman of colour to serve in the United States Congress, Mink ran for president in 1972. She campaigned against nuclear testing in the Pacific, from the Marshall Islands to Alaska. The evening plenary, ‘Migrants and Movements,’ had a focus on more contemporary activism. Emma Amador (University of Connecticut) shared the experiences of Puerto Rican women in the United States, from mid-century to the present. Ethel Tungohan (York University) discussed the contemporary issues faced by Filipina migrant workers in Canada, while Hessed Torres, a British Columbia-based activist in Gabriela, discussed the contemporary experiences of these workers. Finally, Annelise Orleck’s (Dartmouth College) punchy and inspiring presentation related to her recent book, We are All Fast-Food Workers Now: The Global Uprising against Poverty Wages (Beacon Press, 2018). The panel, ‘Spiritual Cosmopolitanism and Women’s Engagement in Transnational Webs of Amity and Activism on the Cusp of Empire, 1860s to 1940s,’ was largely related to the ARC Discovery Grant project, Beyond Empire: Transnational Religious Networks and Liberal Cosmopolitanisms. Spiritual Cosmopolitanism, 2018: Margaret Allen, Lori Osborne, Clare Midgley, Fiona Paisley, and commentator Jane Haggis, with panel chair Noriko Ishii. Image via author. I spoke about Pandita Ramabai and the transnational networks surrounding the Little Wives of India. Clare Midgley (Sheffield Hallam University) drew out the links between nineteenth-century American feminist Caroline Wells Headley, American transcendentalists, and the Indian members of the Brahmo Samaj. Fiona Paisley (Griffith University) surveyed the transnational career and affective entanglements of Jean Begg, a missionary worker in the Pacific who later led the YWCA in Sri Lanka and India. Lori Osborne (Frances Willard Memorial Library and Archives) drew deeply into that archive to sketch the work of the World’s Woman’s Christian Temperance Union (WCTU) in India between 1900 and 1939. In commenting on these presentations, Jane Haggis (Flinders University) argued that the interests of organisations like the YWCA and WCTU were complex. These organisations used the trajectories of empire and proceeded with the assumption that white women had something to bring to the world. At the same time, resorting to binary judgements did not advance understandings of the interactons of these white women with Indian women. While faith might have brought women – both the coloniser and the colonised – together, their interests were not the same. Founded in 1987, the IFRWH is a relatively new organisation. 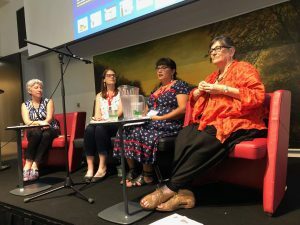 Perhaps many Australian feminist historians became aware of it when its fabulous conference was held in Melbourne in 1998, under the leadership of then-president Pat Grimshaw. The IFRWH commemorates its history and honours the scholars who led the way. At the conference banquet, founding secretary-treasurer Karen Offen (Stanford University) spoke warmly about the life and career of Professor Ida Blom, the Norwegian scholar and founding president who recently passed away. Asha Islam Nayeem (University of Dhaka) spoke affectionately of her mentor, long-time IFRWH member, and Bangladeshi delegate Professor Shirin Akhtar (University of Dhaka), who also passed away recently. It was a great conference, and selected papers will appear in an edited volume and a special issue of Women’s History Review. Watch out for these, which will join the publications coming from previous conferences. For more information about the history of the International Federation for Research in Women’s History, check out its website. Margaret Allen is Professor Emerita of Gender Studies and executive member of the Fay Gale Centre at the University of Adelaide. Margaret began teaching feminist history in 1979. 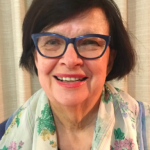 She was convener of the Australian Women’s History Network between 2000 and 2004, and then IFRWH executive member and newsletter editor from 2005 to 2010. Margaret researches transnational, postcolonial and gendered histories, focusing upon links between India and Australia from c. 1880 to 1940. Her recent publications include Cosmopolitan Lives on the Cusp of Empire: Interfaith, Cross-Cultural and Transnational Networks, 1860-1950 (Palgrave Pivot, 2017, with Jane Haggis, Clare Midgley and Fiona Paisley) and ‘”I am a British subject”: Indians in Australia claim their rights, 1880-1940,’ History Australia 15 no. 3 (2018): 1-21.